A "save the date" post. Great news! 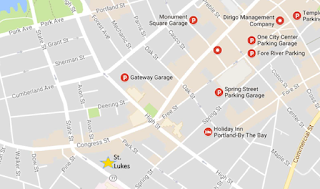 After a very successful Fourth Annual CascoBay UkeFest held on July 28 of this year, the Fifth Annual CascoBay UkeFest will be held on Saturday, September 21, 2019 at St. Luke's Cathedral Portland, ME. We moved the date from July in an effort to provide a cooler place temperature-wise for the warm and soothing sounds of ukuleles. Wonderful news! On Saturday, July 28, at St. Luke's Cathedral on State Street in Portland (across from Mercy Hospital) the Fourth Annual CascoBay UkeFest will kick off at 9:00 AM with three very helpful and fun workshops. The first workshop beginning at 9:00 - and it's FREE - will be led by the talented wife and husband duo of Lynne and Rick Gammon. Lynne and Rick have taught ukulele in a variety of settings and continue to hone their superb ukulele-playing skills as long-time active members of the Falmouth Library Ukulele Society (a/k/a the FLUKES). For the complete novice or someone just starting to play, this session will acquaint you with the uke and provide instruction for a simple strum pattern and a few basic chords. Following this brief workshop, attendees will be able to participate in the other activities of the day. Jim Beloff then follows at 10:00 with a workshop for advanced beginners, but Jim intends that even brand new beginners will get something out of this workshop. For those who know a handful of chords and a basic up/down strum, here’s a chance to take your skills to a new level. Another half dozen or so (dozen if two sessions) well-known songs will be played while learning more chords, new fingerings, new strums, a picking pattern, transposing on the fly and performance tips and techniques along the way. At 11:00, Jim leads another workshop for advanced beginners that can also be called a "jam" because it will consist of playing lots of songs from The Daily Ukulele but with Jim teaching some fine points of each song that can make our playing even more fun. Again, Jim intends that even brand new beginners will have fun trying out these songs. An hour of strumming through a dozen or so songs from both Daily Ukulele songbooks with periodic stops to ooh and ahh over the cleverness of a specific chord change, the enduring elegance of the AABA song structure and how the major 7th chord became a defining sound of the 1970s. The fee for one or both of Jim's workshops is only $10; that is, $10 gets you into either one or both. Combined with the FREE 9:00 workshop, that's only $10 for as many as three all-excellent workshops! More details are coming about the Jim's world premier concerto at Noon with Jim on ukulele along with the Longfellow String Quartet, the Jim and Liz Beloff concert that follows, and then the afternoon of Maine ukulele group performances, and with an easy-peasy audience sing and strum-along song after each performance. Don't forget to bring your ukulele so you can join in the fun! We hope to see you there. What fun we all shall have!! THE UKEFEST IS COMING! THE UKEFEST IS COMING! THE UKEFEST IS COMING! 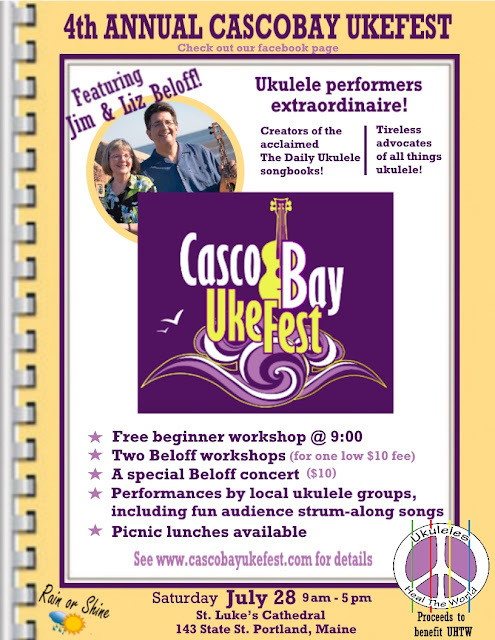 We are very excited to announce that Jim and Liz Beloff will be the headliners for this year's CascoBay UkeFest to be held all day Saturday, July 28, at beautiful St. Luke's Cathedral in Portland, Me. Finding a ukulele at the Pasadena Rose Bowl Flea Market in 1992 inspired Liz and Jim Beloff to start Flea Market Music, Inc., publisher of the popular Jumpin’ Jim’s series of ukulele songbooks. This series is sold worldwide and includes The Daily Ukulele: 365 Songs For Better Living and The Daily Ukulele: Leap Year Edition, two of the biggest and best-selling ukulele songbooks ever published. As performers, Liz and Jim have become known for their breezy, close harmonies on standards and Jim’s original songs. They perform together regularly throughout the USA, playing their family-made Fluke, Flea and Firefly ukuleles. They have also toured Japan, Australia and Canada and believe in their company’s motto, “Uke Can Change the World.” www.fleamarketmusic.com and facebook.com/jimbeloffmusic. Please stay tuned for some exciting details, including ukulele workshops, concerts, and concertos. 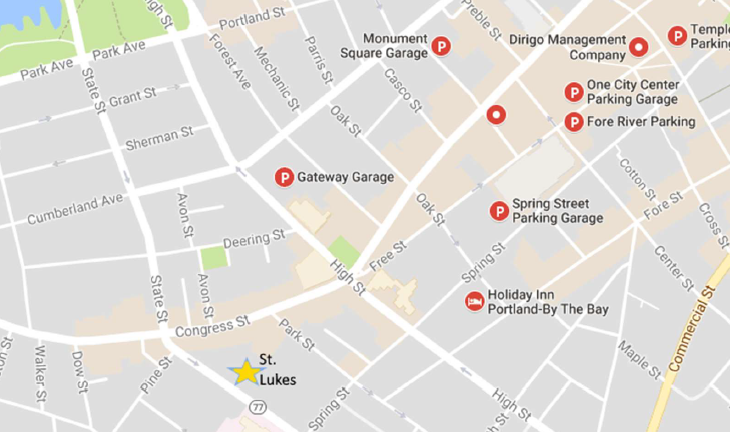 While you're participating in Saturday's UkeFest, here are the locations of nearby parking garages. 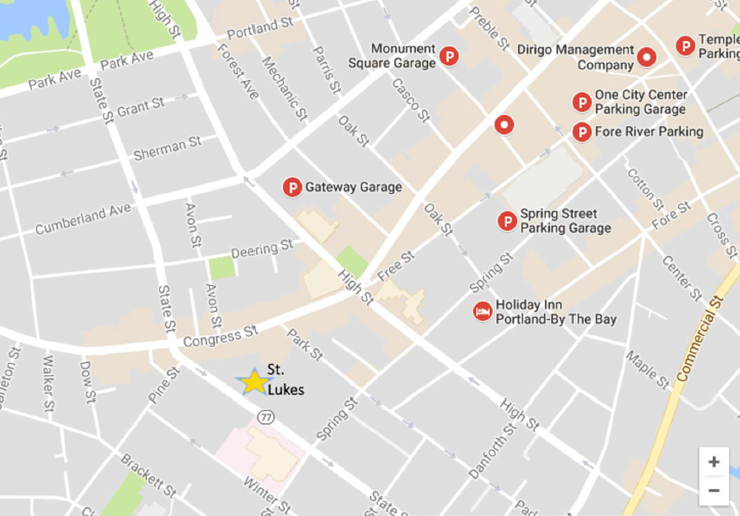 There is also a surface lot behind St. Luke's on Park Street. There will be hand-outs of the following information, as well as copies of all five sing-and-strum-along songs. Very cool! Here we go! 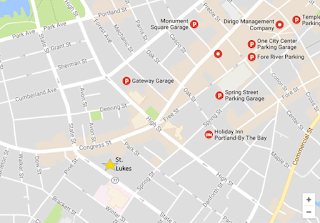 The Third Annual CascoBay Ukefest is happening soon, July 29 from 9:30 to 4:00 to be exact, at St. Luke's Cathedral Portland, ME. Here's what The Day will look like. Stuart is a performing and teaching artist who has presented his innovative and holistic music workshops at the top ukulele festivals across the US and Canada. In his concerts, Stuart balances virtuosity and heart on his classical guitar, ukulele, Native American flute, and didjeridoo. Stuart is committed to a compassionate and holistic vision of music education and has taught and led clinics for all ages - from pre-K through college. This workshop is for ukulele enthusiasts of ALL LEVELS who would like to review some of the foundations of ukulele playing and music study in general. While this session is geared for beginners, there will be plenty of great takeaways for more experienced players as well. By the end of this session players will understand how to play with greater coordination, speed, tone, and a relaxed control. Stuart will also lead the group through a sequence of his "Ukulele Zen" exercises that will strengthen and improve flexibility in your hands and fingers. This workshop is open to BEGINNERS AND UP - some basic experience playing ukulele is recommended. Rock and roll ukulele is not so much about technique as it is about an attitude. This workshop is about shedding inhibitions and letting your inner rock and roller out. In this workshop, Stuart adapts Rockabilly and Rock ’n’ Roll guitar styles adapted for ukulele. You’ll play classic songs and learn the style of Rockabilly rhythm and lead playing in the styles of Carl Perkins, Chuck Berry, Little Richard, Eddie Cochrane, The Beatles, Elvis, and more. Stuart orchestrates the group into a fun multi-part band. This workshop will teach you some killer rock ’n’ roll tricks for ukulele including songs by Chuck Berry, Little Richard, Carl Perkins, Eddie Cochrane, Elvis, The Beatles, and more. Noon Concert by Stuart Fuchs - A $10 donation is suggested; and the net proceeds of the UkeFest from the concert and the sale of tee shirts, decals, and lunches will be donated to the St. Luke’s Food Pantry. 1:00 - 1:30 Bag Lunches available A limited number of bag lunches will be available for $6 - delicious cheese, pepperoni, a thick bread roll, hummus and carrots, a banana, a bottle of water, and a homemade cookie. 1:30 The Merry Plinksters -The Merry Plinksters Ukulele Group is the ongoing year-round extension of a 4-week Ukulele 101 class that is offered twice a year at RSD9 Adult Education in Farmington. Facilitator Michael Burd is also the Technology Instructor there. The group, founded in 2010, has an extensive and unique catalog of songs spanning many decades and genres. 2:00 The PI Ukes - The PI Ukes (Peaks Island Ukes) are a grass-roots group that gets together on Monday nights at 6:30 to play for an hour and enjoy each other's company. They play diverse repertoire, members number over 30, and they are warm and welcoming and focused on having a good time. 2:30 The FLUKES - The FLUKES (Falmouth Library Ukulele Society) boast a membership of over 35 ukulele musicians. During weekly Wednesday night rehearsals, they’ve built a repertoire from many different musical genres, practicing, playing and most of all having a lot of fun. 3:00 The Ukulele Strummers of Southern Maine - The Ukulele Strummers of Southern Maine (USSM) welcome all to their twice-monthly meetings on the first and third Sundays at Parsons Memorial Library in Alfred, Maine, from 1:00-3:00 p.m. They play round robin style: bring a song or two to share or perform--everyone gets a turn--or just play along for fun. All level players are welcome. 3:30 The UU’s - The UU’s are a small group of ukulele-playing friends who get together regularly in Lee Urban’s living room in Portland to play ukulele, sing, and have great fun. All are welcome - ukulele players, wannabes, and admirers of all things uke!